Ahhh, Huntington Beach: the stretch of Orange County coastline known around the world as Surf City, USA. Sure, it’s got a well-deserved reputation for eternal sunshine, choice waves, and hot beach bodies, but there’s so much more than that out here -- to prove it, we’ve gathered together 27 things to do in Huntington Beach that have nothing to do with surfing. OK, fine, some of them have to do with surfing, but others have to do with beer, nature walks, history... and did we mention beer? For 10 uninterrupted miles from Sunset Beach to Newport, you can ride a bike, a skateboard, or pretty much anything else with wheels (shopping cart?) down the Huntington Beach Bike Trail, taking in picturesque beach views and some sand-side eats along the way. Roll far enough down the beach path and you’ll find Naugles’ summers-only beach shack, part of the greatest fast-food comeback story of all time. Local food blogger Christian Ziebarth won a lawsuit against Del Taco to revive the Naugles brand and personally reverse-engineered recipes for nostalgic dishes like the bun taco -- which is, yes, a taco on a bun. If you like hoppy, bitter, West Coast-style ales, Huntington Beach has plenty of places to quench your thirst. Stop by Riip Beer Company’s PCH tasting room or Beachwood Brewing’s new industrial park digs to find beers once honored at the Great American Beer Festival, like Mocha Machine and Super Cali IPA. 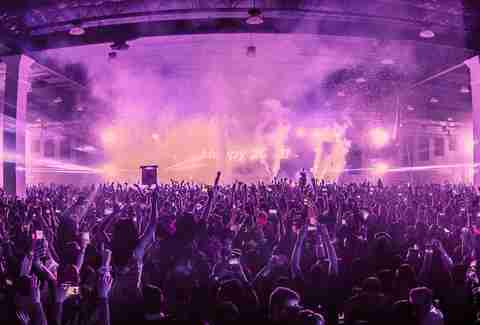 What do you get when you combine two days of sets from the best EDM DJs with a carnival’s worth of rides and inflatable attractions right on the beach? It’s called Sundown, and it’s the ultimate California summer beach party. And if your birthday is in September, entry is entirely free. Right off Main St is an appropriate ode to Surf City USA -- the laid-back International Surfing Museum. This tiny room tucked on a side street is filled with local lore, exhibits on famous local surfers, and displays of boards made in OC, a room of unparalleled ephemera well worth the $2 admission. Did the Surfing Museum inspire you to pick up a board and dive in? Some of the best waves in the area are on the south side of the Huntington Beach Pier and you can swim out and catch some yourself -- or, you know, watch from the sand as the world’s best duke it out with nature. 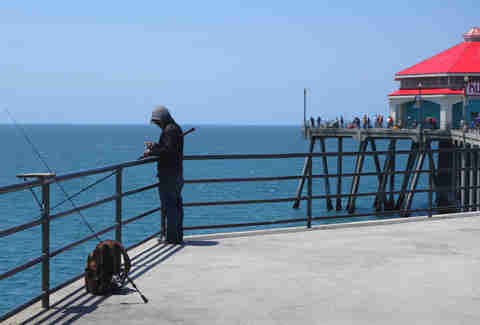 Get on top of the water without getting wet by strolling your way down the historic Huntington Beach Pier. One of the original Ruby’s Diners awaits you at the end, where you can nosh on classic American burgers, fries, and sweet, sweet strawberry shakes. If catching your own meal is more your style, you can always throw a line over the side of the pier and wait for a bite. As one of the few places in the state where you can fish without a license, HB is a great place to catch everything from corbinas to croakers. Forget the Grauman’s Chinese Theatre in Hollywood. When in Orange County, hit up the Surfers' Hall of Fame in front of the Huntington Surf & Sport on Main St, a mosaic of cement bricks emblazoned with the hand- and foot-prints of local surfing legends, from Laird Hamilton to Shawn Stussy. No, you’re not in New York City. But just like the Big Apple, Huntington Beach has its own Central Park which, at 350 acres, is the largest city-owned park in OC. There are tons of amenities (see disc golf below) and annual events (dog and car shows, Revolutionary War re-enactments, etc. ), but mostly, it’s just a pretty place to walk around and throw out the old picnic blanket. Take a peek into what this land looked like 100 years ago at Shipley Nature Center, an 18-acre, fenced-in nature reserve that restored several early California habitats to what they might have looked like before all the region’s houses, roads, and Panda Express franchises were built. 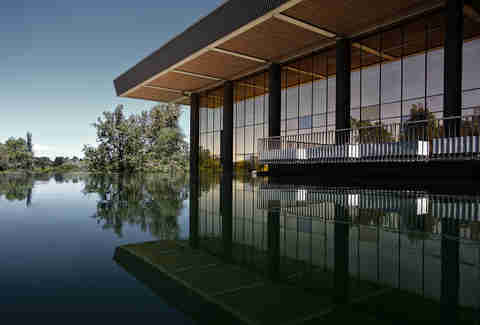 Don’t confuse this building with the Huntington Library in LA -- the two could not be more different. This one is a Richard and Dion Neutra gem, which means it’s an icon of mid-century modern architecture with indoor fountains, floor-to-ceiling windows, and a wonky central bookstack that wouldn’t be out of place in an M.C. Escher painting. Huntington Central Park’s disc golf course is the only disc golf course in OC, so if you want to toss a frisbee around for 18 holes, this is your spot. For $1 per person ($2 on the weekends), you and your buddies can score the perfect tee time. See how many of the nearly 200 species of birds you can spot when you walk the dirt trails at the Bolsa Chica Ecological Reserve. With five miles of public walkways surrounded on three sides by fancy suburban homes, enjoy the expanse of nature on your own or take one of the free tours offered on select weekends. Poke might be trending around the country these days, but North Shore Poke Company was way ahead of the curve, landing on the West Coast in 2012 with not only bowls of the raw fish dish, but also poke nachos, sashimi sandwiches, and -- in typical SoCal-fusion fashion -- poke tacos. 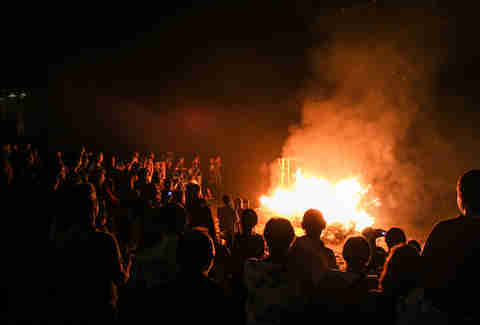 There aren’t a lot of places in California where you can start a bonfire on the beach, but then again, Huntington Beach is not a lot of places. Hundreds of free-use fire pits dot the city’s sandy coastline -- all you have to do is bring the food, refreshments, and friends. Every summer (usually the last week of July), the best surfers in the world convene on Huntington Beach for a full week of competitions and expos in sunny SoCal. Get autographs from your favorite pros, watch BMX and skate demos, or just watch as world titles are won -- no ticket required. Old World is a European-themed mall disguised as a replica of an old German village. All year long it’s home to a European market, a German restaurant, and a chateau-like hotel, but it’s the massive Oktoberfest celebration every September that draws thousands of beer-swillers and lederhosen-wearers alike. On Tuesday nights, Main St hosts the county’s largest street fair and farmers market, which takes over three blocks with art, retail, and entertainment. Browse the 90-plus vendors (there’s no admission fee) or just watch as talented teens compete for prizes -- all in the heart of Surf City. Like every new unbearably hip retail development, Pacific City has a gourmet food court, a stage for weekend live music, and an outdoor ping-pong table set up for shoppers who want to take a break. 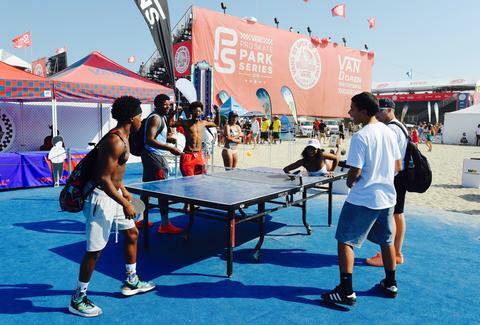 Get the paddles from the info booth and challenge your friends to a game with an ocean view. The burritos at Secret Spot have fueled generations of area surfers, who stop by this vegan-friendly surf shack on the way out or back from their morning sesh. Get a fresh-squeezed juice paired with an HB Surround Sound Burrito, and taste what it’s like to be a real local beach bum. Sand volleyball is a city pastime as time-honored as surfing, and with dozens of free courts scattered all along the 10 miles of uninterrupted beach, there’s never a bad time to grab a few friends and plan an attack. Don’s is technically in the annexed town of Sunset Beach a few miles up the road, but this Tiki wonderland is a Polynesian-style destination worth the trip. Try one of Don’s famous tropical cocktails (he invented the Zombie, the Navy Grog, and more) and stay for the live music, which can always be found in one of the restaurant’s multiple rooms filled with island decor. Peek inside historic ranch life at the nearly 120-year-old Newland House Museum, which for $2 lets you browse the personal effects of pioneers William and Mary Newland. The oldest residence in the city, it sits on a hill that’s now only accessible by driving through a retail shopping center. 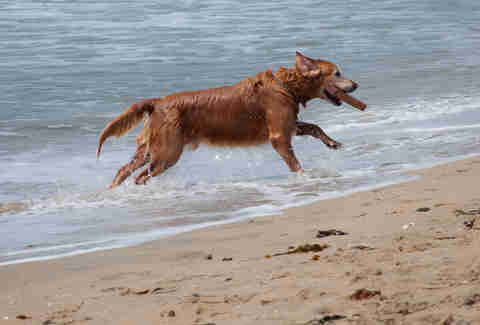 Fido doesn’t have to stay in the car when you go to Huntington Dog Beach, one of the few designated beaches where dogs are allowed to romp alongside you through the sand and waves. Park in one of the lots off PCH and head down the bluff for one of the mellowest (and sure, cutest) stretches of beach around. 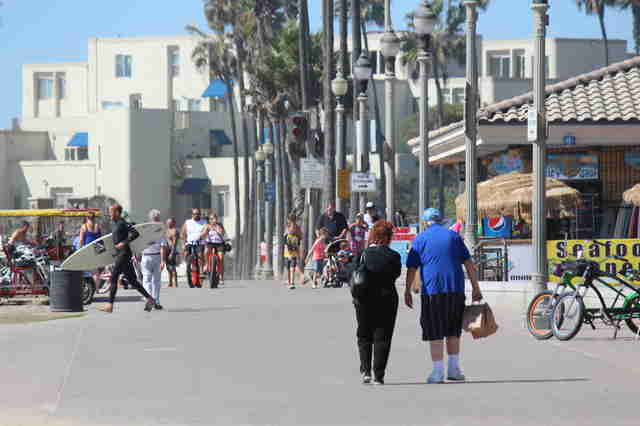 Experience more than a century of beach town nostalgia with Huntington Beach’s self-guided historic Downtown walking tour. Stop by the Visitor Information Kiosk at the foot of the pier to grab a brochure that’ll guide you through 35 stops along a 1.5-mile loop. Every February since 2005, local filmmakers have watched their indie projects on the big screen at this small-but-mighty take on the big-time Hollywood film fest. The fest’s new ownership intends to make things even more focused on Huntington Beach, so expect it to support, educate, and embolden OC’s burgeoning film industry.